Home remedies for dandruff can help cure symptoms and rid a person of embarrassing flakes for good. Though over the counter and prescription dandruff remedies can be attained, they fail to address the root cause of the condition. One of the central keys to naturally treating dandruff is to understand what it is, what causes it, knowing how to clearly identify its symptoms and empowering oneself through knowledge of alternative home remedies. 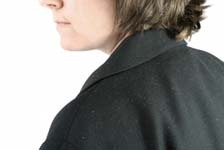 Dandruff is best described as the excessive shedding of skin on the scalp. Avoiding harsh shampoos or hair treatments and avoiding shampoos that contain alcohol. Using olive oil on hair gives the scalp healthy nourishment with such vitamins as vitamins A, E and K. Olive oil also has anti-inflammatory qualities, which can be helpful when the scalp is irritated. Olive oil should be warmed slightly and applied to the hair and scalp, and allowed to permeate both for at least 30 minutes before shampooing and rinsing. Washing hair in baking soda, which helps to neutralize oils and rids the scalp of dead skin cells. Wash hair in organic apple cider vinegar, which restores the scalp’s pH balance while controlling oily skin on the scalp. Boil white beets in water and use the water to pre-treat hair before washing. Making a paste of fenugreek seeds that have been well soaked for eight hours or more and massaging the paste into hair before shampooing. Aloe Vera gel applied to the scalp 20 – 30 minutes before shampooing helps soothe the scalp, remove dead skin cells and conditions skin to restore it to its natural health. Mix lemon peels with extra virgin coconut oil and allow the mixture to absorb direct sunlight for one week or up to 10 days. Strain the mixture and use it to pre-treat hair before shampooing. Washing hair in green gram powder twice weekly helps keep the scalp healthy and keeps dandruff at bay. Treat scalp regularly with juice from the snake gourd as an effective way to control dandruff flakes. A change in diet is necessary for the long-term treatment of dandruff and is essential in using home remedies for dandruff. A diet that is high in juicy fruits, but low in citrus fruits should be balanced with other healthy foods and vegetables. Anyone who suffers from dandruff symptoms should also avoid all processed or refined sugar or flour, as well as avoid junk foods and other processed foods that can be highly toxic and cause a variety of health ailments. Home remedies for dandruff are economical, effective, safe to use and are safe for the environment. Other dandruff remedies can be expensive to maintain, but many of the natural cures and home remedies used to treat dandruff are already in the kitchen cabinet.